On July 19th, 5.30 pm in Kaunas Photography Gallery will be held opening of Romualdas Požerskis exhibition “Pilgrimages”. Požerskis took photos of pilgrimages in 1974–2001 and visited various places of Žemaitija and Dzūkija, but a sense of wonder, a new perspective of the world remained throughout his series of photos. Požerskis discovered valuable signs of time from the documentary point of view not only in the sacral, but also in more earthly process of pilgrimages: interaction between different generations, preparing for ceremonies and celebration when they end. 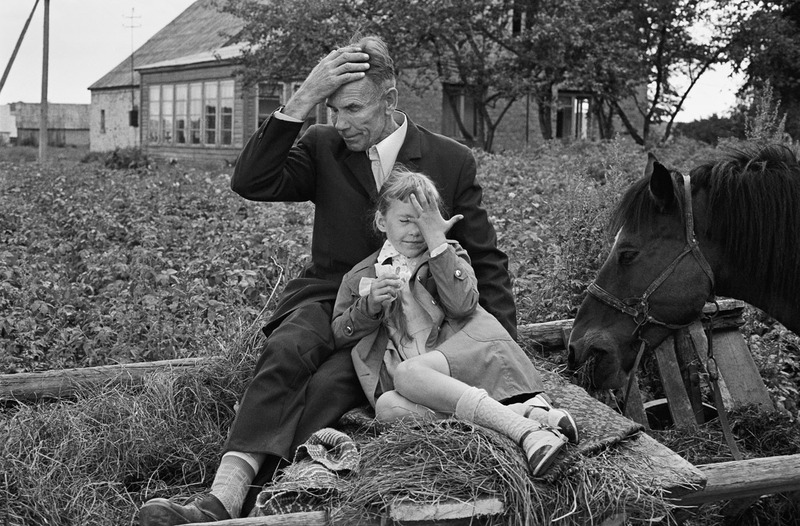 However, having paid attention to the archaic Lithuanian rural traditions and without losing the important ability to the photographer to be surprised at being captured life, Požerskis in his works did not show them pilgrimages just as strange masquerade, taking place in the unfamiliar to the photographer sociocultural environment. In this case photographer’s role was not limited to dispassionate “ethnological” observation. He managed to find a personal emotional connection with distinctive Lithuanian rural world and bring it to a wider audience. The life in the photos paradoxically turned into (imaginary) collective experience, embodied in the brightest form of social rituals and religious ceremonies. Just so the people, their types of character and attitude, traditions and way of life in Romualdas Požerskis’ works are more than just fragments of strangers’ life. The latter in this cycle makes the entire image of Lithuanian nature. Although people come to the festival only for a short time, spiritual community and the sense of community based on social relations is also experienced for a temporary basis, however, photography saves the signs of this experience and creates a longer-lasting foundation for common identity with national culture associated Lithuanian nature. As other Lithuanian photographers, Požerskis in his creative work having connected a humanistic worldview with motifs of Lithuanian traditions and then cloaked it in the festive aura, it seems, have created a photography cycle, notable even in the context of international photography. The ability to enter into an unfamiliar environment and to take photos of its traditions and rituals easily persuades that the photographer was able to discover a unique little world, the boundaries of which were marked by a particular historical period and social, cultural and political circumstances. This exhibition is dedicated to the remembrance of Virginija Požerskienė. Exhibition runs until August 24th. Photograph: Romualdas Požerskis, Kražiai, 1977.